6. If air conditioning is desired, turn the air conditioning system (if equipped) on. 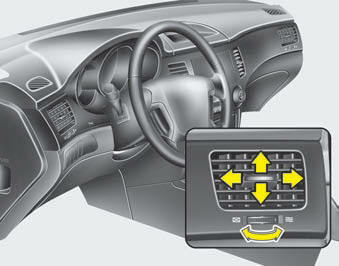 The mode selection knob control the direction of the air flow through the ventilation system. Air can be directed to the floor, dashboard outlets, or windshield. Six symbols are used to represent MAX A/C, Face, Bi-Level, Floor, Floor-Defrost and Defrost air position. 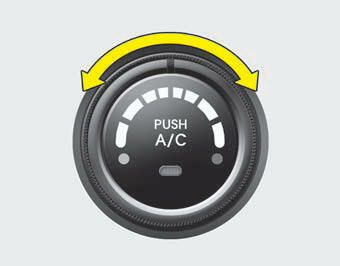 The MAX A/C mode is used to cool the inside of the vehicle faster. Air is discharged through the face level vents. 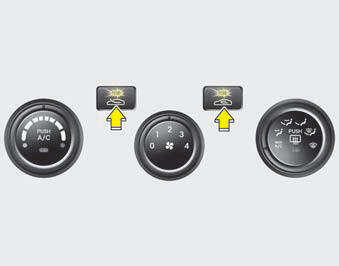 If the “MAX A/C” mode is selected, the A/C will turn on automatically and “Recirculation” mode will be activated. The outlet port can be opened or closed separately using the horizontal thumbwheel. To close the vent, rotate it to the far left position. To open the vent, rotate it right to the desired position. 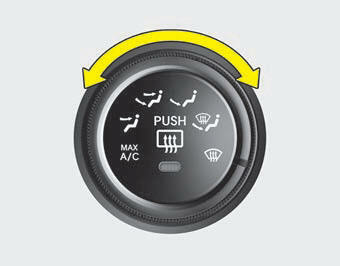 The temperature control knob allows you to control the temperature of the air flowing from the ventilation system. To change the air temperature in the passenger compartment, turn the knob to the right position for warm air or left position for cooler air. recirculated air position is selected. drawn through the heating system and heated or cooled according to the function selected. outside (fresh) air position is selected. Prolonged operation of the heater in the recirculated air position (without air conditioning selected) may cause fogging of the windshield and side windows and the air within the passenger compartment may become stale. In addition, prolonged use of the air conditioning with the recirculated air position selected will result in excessively dry air in the passenger compartment. • Continued used of the climate control system operation in the recirculated air position may allow humidity to increase inside the vehicle which may fog the glass and obscure visibility. • Do not sleep in a vehicle with the air conditioning or heating system on. It may cause serious harm or death due to a drop in the oxygen level and/or body temperature. • Continued used of the climate control system operation in the recirculated air position can cause drowsiness or sleepiness, and loss of vehicle control. Set the air intake control to the outside (fresh) air position as much as possible while driving. 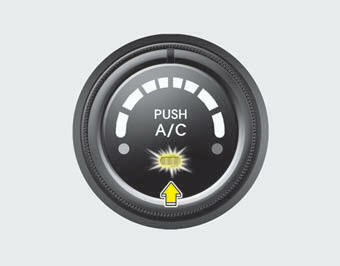 The fan speed control knob allows you to control the fan speed of the air flowing from the ventilation system. 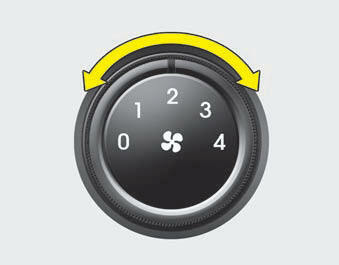 To change the fan speed, turn the knob to the right for higher speed or left for lower speed. Setting the fan speed control knob to the “0” position turns off the fan. • To keep dust or unpleasant fumes from entering the car through the ventilation system, temporarily set the air intake control to the recirculated air position. Be sure to return the control to the fresh air position when the irritation has passed to keep fresh air in the vehicle. This will help keep the driver alert and comfortable. • Air for the heating/cooling system is drawn in through the grilles just ahead of the windshield. Care should be taken that these are not blocked by leaves, snow, ice or other obstructions. • To prevent interior fog on the windshield, set the air intake control to the fresh air position and fan speed to the desired position, turn on the air conditioning system, and adjust temperature control to desired temperature. All KIA Air Conditioning Systems are filled with environmentally friendly R-134a refrigerant which does not damage to the ozone layer. 4. Adjust the fan speed control and temperature control to maintain maximum comfort. • When maximum cooling is desired, set the temperature control to the extreme left position then set the fan speed control to the highest speed. • When using the air conditioning system, monitor the temperature gauge closely while driving up hills or in heavy traffic when outside temperatures are high. Air conditioning system operation may cause engine overheating. Continue to use the blower fan but turn the air conditioning system off if the temperature gauge indicates engine overheating. • When opening the windows in humid weather air conditioning may create water droplets inside the vehicle. Since excessive water droplets may cause damage to electrical equipment, air conditioning should only be run with the windows closed. • If the vehicle has been parked in direct sunlight during hot weather, open the windows for a short time to let the hot air inside the vehicle escape. • To help reduce moisture inside of windows on rainy or humid days, decrease the humidity inside the vehicle by operating the air conditioning system. • During air conditioning system operation, you may occasionally notice a slight change in engine speed as the air conditioning compressor cycles. This is a normal system operation characteristic. • Use the air conditioning system every month if only for a few minutes to ensure maximum system performance. • When using the air conditioning system, you may notice clear water dripping (or even puddling) on the ground under the passenger side of the vehicle. • Operating the air conditioning system in the recirculated air position provides maximum cooling, however, continual operation in this mode may cause the air inside the vehicle to become stale. 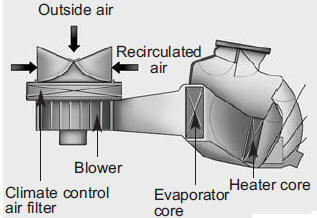 • During cooling operation, you may occasionally notice a misty air flow because of rapid cooling and humid air intake. This is a normal system operation characteristic. The climate control air filter installed behind the glove box filters the dust or other pollutants that come into the vehicle from the outside through the heating and air conditioning system. If dust or other pollutants accumulate in the filter over a period of time, the air flow from the air vents may decrease, resulting in moisture accumulation on the inside of the windshield even when the outside (fresh) air position is selected. If this happens, have the climate control air filter replaced by an authorized KIA dealer. • If the car is being driven in severe conditions such as dusty, rough roads, more frequent climate control air filter inspections and changes are required. • When the air flow rate is suddenly decreased, the system should be checked at an authorized KIA dealer. It is important when servicing the air conditioning system that the correct type and amount of oil and refrigerant is used. Otherwise, damage to the compressor and abnormal system operation may occur.